Wait, I Have to Pay My Health Insurance Carrier Back? 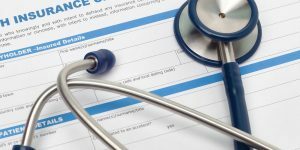 If you have ever had a personal injury claim that has resolved either through a settlement or a verdict, the attorney handling your case likely told you that a portion of your settlement would have to be used to pay back your health insurance company for the medical bills they paid relating to your injuries. 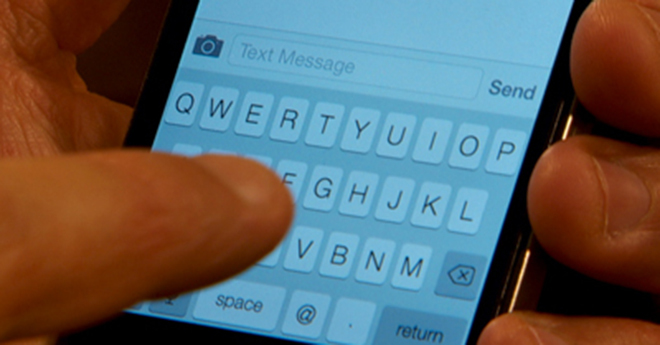 This process is call subrogation and can have a major impact on your personal injury case. For the purpose of this post, we will be discussing how subrogation works in the context of medical bills that have been paid by private health insurance companies, such as BlueCross BlueShield or Humana. However, it is important to note that the subrogation process applies, not only to private health insurance companies, but also to government entities such as Medicare, Medicaid, Tricare or any other entity that pays to satisfy your medical bills, which then make the basis of your personal injury claim, including hospitals. Furthermore, in regards to governmental entities, a failure to protect their subrogation interests can result in significant penalties to all individual attorneys and/or parties that impaired the governmental entity’s right to get reimbursed. Therefore, the attorney handling your personal injury claim should be aware of which entities are paying your medical bills, so they can make sure to properly protect their subrogation interest. Here is generally how the subrogation process works as it relates to private health insurance companies: When you sign up for health insurance, you sign a contract with the health insurance company, which provides that, in exchange for you paying a monthly premium, the health insurance company will pay your medical bills when you seek medical treatment. However, that contract contains a paragraph stating that your health insurance company is entitled to seek repayment for the medical bills they paid, if you use those medical bills as a basis to recover from a third party. The idea is that your health insurance company would not have had to pay your medical bills if it weren’t for the wrongdoing of the third party, so your health insurance company is entitled to be reimbursed what it paid. Beginning November 2017, Alabama motorists should be prepared to incur stiff penalties if they are caught without liability insurance on the state’s roadways. Although Alabama motorists have been required to carry liability insurance on their vehicles since the Alabama Mandatory Insurance Act was initially passed in 2013, the Alabama Legislature recently enacted a bill which gave the Alabama Law Enforcement Agency a procedure to levy civil penalties against drivers found to be in violation of the previously enacted Alabama Mandatory Insurance Act. The bill, which was passed by the Alabama Legislature in 2016, gave drivers a grace period in an effort to allow motorists time to obtain proper coverage. The U.S. Judicial Panel (JPML), a separate body within the Federal Court System, has granted the plaintiff’s second motion for consolidating Proton Pump Inhibitor (PPI) drug claims to Multidistrict Litigation (MDL). This allows the plaintiffs to consolidate the cases that allege PPI drugs caused kidney disease in those who used them. The benefit for plaintiffs is that the consolidated action will expedite the overall process, prevent duplicate discovery, and reduce a backlog in the court system. 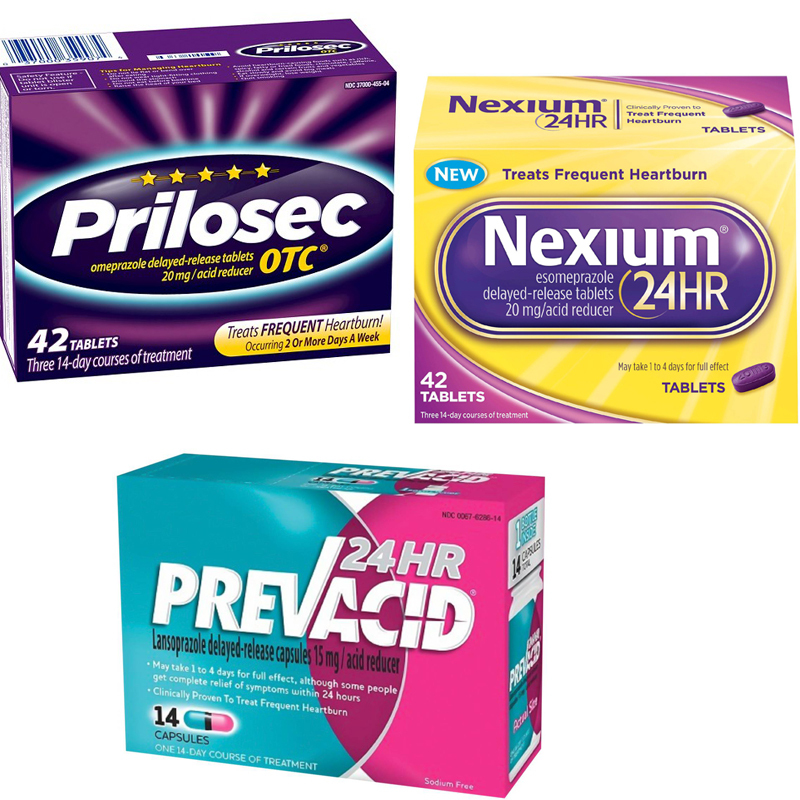 The PPI drugs at issue include four prescription drugs: Prilosec, Nexium, Protonix, and Dexilant; and three over-the-counter drugs: Prilosec OTC, Prevacid 24-hour, and Nexium 24-hour. Plaintiff’s allege these PPIs cause kidney injuries, which include acute interstitial nephritis, chronic kidney disease, and end-stage renal disease. This type of drug first received FDA approval in 1989. The suits, citing a host of studies, claim the manufacturers of the PPI drugs (the defendants) should be held liable and accountable for the damage caused to patients while taking said drugs. 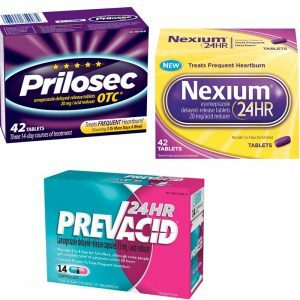 Furthermore, the defendants should take financial responsibility for failing to warn consumers of the potential health issues related to PPIs. Are “Possible Causes” of an injury admissible? Any attorney who has ever litigated a personal injury claim has heard the legal standards “reasonable degree of medical certainty” or “reasonable degree of medical probability.” Further, attorneys understand and appreciate that the plaintiff has the burden of proving that the claimed injuries were caused by the underlying events in compliance with these standards. However, what do the standards mean and what is required? In essence, the standards require that it is more probable than not, or more likely than not, that the claimed injuries were caused by the incident giving rise to the lawsuit. Typically, a qualified medical doctor or medical clinician will have to testify on this issue. In many circumstances where medical causation is in dispute, the defendants may respond or defend the case by asserting that the claimed injuries were not caused by the underlying incident, or were in fact caused by some other, unrelated event. The question becomes: What legal standard applies to a defendant desiring to make this argument and admit evidence in furtherance of same. Can the defendant introduce “possible” alternative causes? 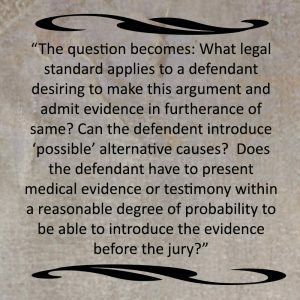 Does the defendant have to present medical evidence or testimony within a reasonable degree of probability to be able to introduce the evidence before the jury? These questions are often raised and debated in many personal injury cases throughout the State of Alabama and around the country. While the issue may be addressed or handled differently among the jurisdictions, the better practice should be to hold the defendants to the same standard of admissibility as the plaintiff. Under no circumstances would an Alabama trial judge allow a plaintiff to present medical testimony indicating that his injuries were only “possibly” caused by the incident. If this were the testimony in the case, the defendant would undoubtedly file a motion in limine to preclude the plaintiff from arguing that the claimed injury was caused by the accident. Alabama law is clear that “possible causes of an injury to a plaintiff represent nothing more than rank conjecture and speculation.” Western Ry. of Ala. v. Brown, 196 So. 2d 392 (Ala. 1967); see also Hooks v. Pettway, 142 So. 3d 1151 (Ala. Civ. App. 2013); Portis v. Wal-Mart Stores East, L.P. 2008 WL 3929672 (S.D. Ala. 2008). 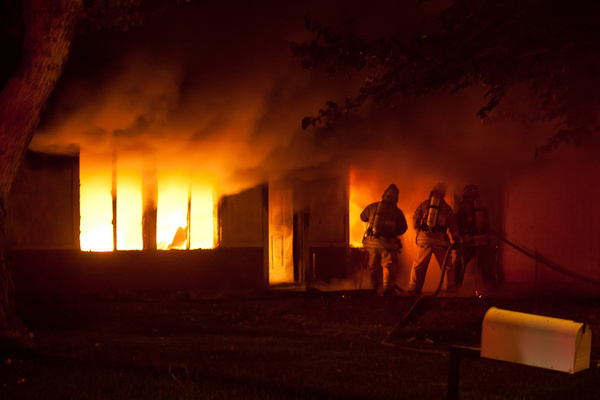 Fires are a leading cause of burn injuries, death and property damage in the United States and in the world. According to the World Health Organization, some 265,000 people die worldwide due to fire-related incidents. Lower-income areas are more prone to fire accidents, injuries and deaths than higher-income demographics. In the same vain, lower-income countries see far more fire-related deaths than the United States. The American Burn Association in 2016 recorded 486,000 burn incidents in the United States that required medical attention, 3,275 of which resulted in fire or smoke inhalation deaths. Some 40,000 Americans are hospitalized each year due to burn injuries, 30,000 of those are admitted to specialized burn units. Most burns, a whopping 73 percent, in the U.S. result from in-home accidents. And while most burns are a result of fire or flame, many occur due to scalding, contact, chemicals, and electrical episodes. “Absence evidence” is evidence that there are no prior documented occurrences of a certain event. Attorneys use “absence evidence” to argue that because there are no prior documented occurrences of said event, it is not likely that said event would have occurred on this occasion. One of the primary uses of absence evidence is in products liability cases. For example, manufacturers of an older product might want to show the jury that their product has not caused any accidents over the last twenty-years and thus it is less likely that their product is defective in the current lawsuit. 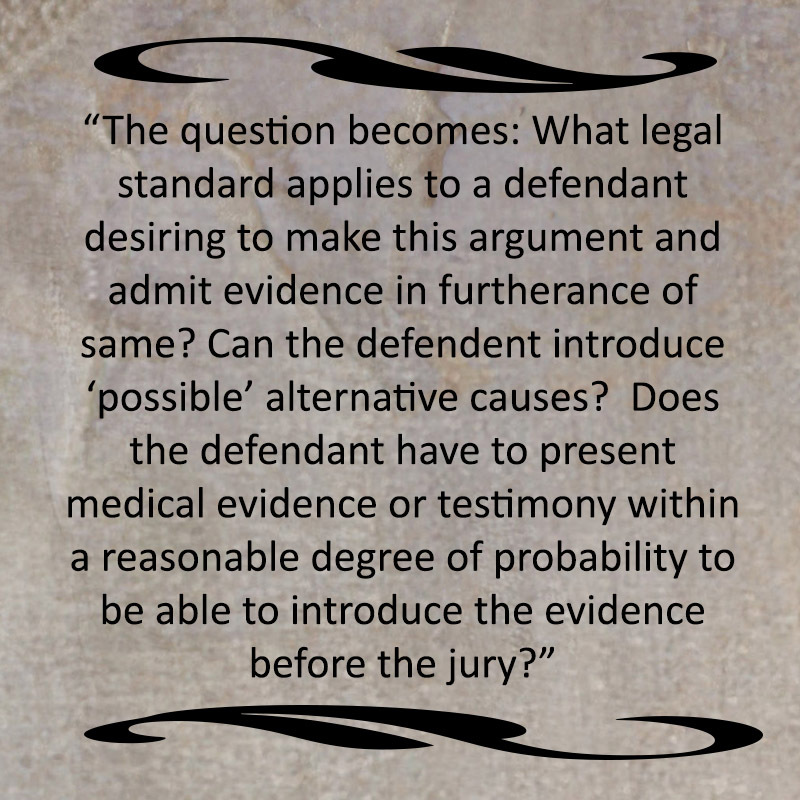 When a party wishes to use absence evidence, particularly in these kinds of cases, the court must determine whether evidence that a prior event has not occurred is accurate and if so, is it fair to present such evidence to the jury. 1. Does the lack of a prior occurrence accurately reflect the prior history of the occurrence? After hearing thirty-seven days of trial testimony and deliberating for four days, a Texas jury determined that Johnson & Johnson was liable for defectively designing their metal-on-metal hip implants. The lawsuit alleged that Johnson & Johnson aggressively marketed their Pinnacle metal-on-metal hip implants for use by younger, more active patients because the metal-on-metal implants were long-lasting, durable and safe despite being aware of the design flaws in the implants, which caused them to fail more frequently and quickly than expected, leading to injuries including tissue death, bone erosion and high levels of metal in their blood. The five Plaintiffs who brought the lawsuit collectively received a $502 million judgment which was comprised of $142 million in compensatory damages and $360 million in punitive damages. The verdict will be split amongst the Plaintiffs based on the severity and impact that each Plaintiff suffered as a result of their individual injuries. Unfortunately, Johnson & Johnson has vigorously stated since the massive verdict was returned that they will appeal the result. One of the many issues that will certainly be raised on appeal is Texas’ law which caps punitive damages. This means that on appeal the $360 million punitive damage award could be reduced to as low as $10 million. However, despite a pending appeal and a possible overall reduction in punitive damages, the recent verdict is still an overwhelming triumph for Plaintiffs who suffer from defective metal-on-metal hip implants. Most notably, the recent verdict marks Johnson & Johnson’s first trial loss regarding the use of metal on metal artificial hips. In a prior trial in the same multi-district litigation (“MDL”), Johnson & Johnson was successful in defending a single Plaintiff suit based on its argument that it was the surgeon who installed the implant’s fault instead of the defective implant itself. However, based on this most recent verdict it appears the tide has begun to change in favor of the Plaintiffs, and Johnson & Johnson will no longer be able to overlook its defective product and place blame on the implanting surgeons. Johnson & Johnson has faced several lawsuits over the past year alleging that Johnson & Johnson knew there was a link between their antipsychotic drug, Risperdal, and abnormal breast growth. Risperdal is a very powerful antipsychotic drug that Johnson & Johnson peddled to pediatric doctors for use by children even though the drug lacked certain approvals from federal regulators. Thus far, Johnson & Johnson has been hit with four separate jury trials all alleging that Johnson & Johnson not only knew that children prescribed Risperdal could develop a condition known as gynecomastia, but also that Johnson & Johnson failed to properly warn and/or disclose the risks of abnormal breast growth in adolescent boys prescribed Risperdal.